This was on my TBR pile challenge list. 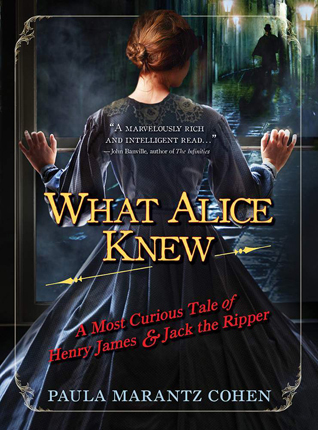 It tells the story of how Henry James, the American/British novelist, his brother William, the noted psychologist and philosopher, and sister Alice, an invalid diarist worked together to solve the case of Jack the Ripper. The siblings each use their particular expertise to find clues, and work together as a team to piece together the solution. It's interesting that the sibling with the most to offer is left out of the title. William James, already a pioneer in psychology, is summoned to Scotland Yard to help build a profile of the killer. Henry uses his entree into the art world to mix and mingle with upper-class suspects. Alice, who seems mostly afflicted with the malaise that very sheltered women with bright minds are prone to, is the one with sufficient idle time and imagination to put herself in the killer's shoes. The solution is interesting, the descriptions are good. The solution isn't among the usual suspects. Sign into Goodreads to see if any of your friends have read What Alice Knew.